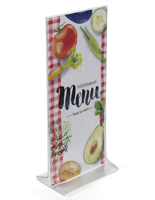 5.5" x 8.5" 8.5" x 11" 11" x 14" 11" x 17"
This table sign holder is commonly used in retail stores, restaurants and other public environments to display signage. 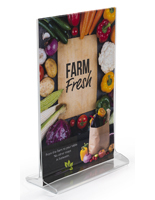 The clear acrylic construction provides a durable and non-distracting frame for any type of promotional graphics. 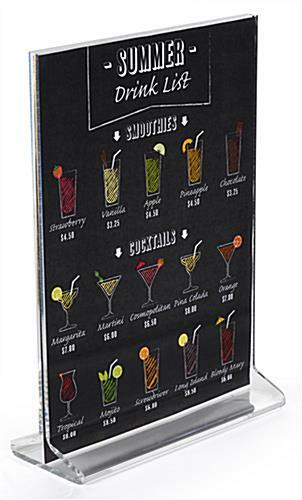 Each table sign holder is 5"x7" which makes for an ideal size to place on restaurant tabletops to promote a menu or drink special. The relatively small frame doesn't take up a lot of space, yet is large enough to catch the eye of curious patrons. 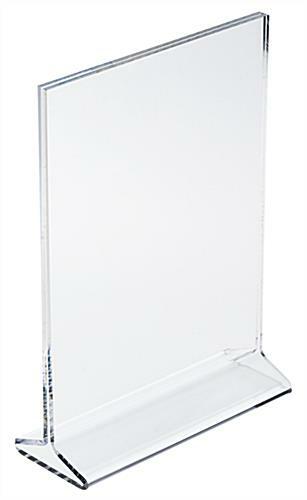 The simple design of this table sign holder allows for quick and easy change-outs. The old graphics slide out through the opening in the top. 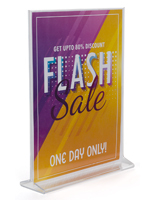 Each table sign holder can be used to hold two different prints back-to-back. Users should note that a thinner card stock should be used when placing two separate images in this frame to ensure a proper fit. To further personalize this table sign holder; we offer custom silkscreen imprinting for this model. Minimum order requirements are listed below. 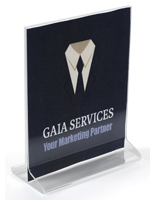 Buy this table sign holder and have your restaurant's logo or graphics imprinted on the base. Customers will appreciate the personalized look. 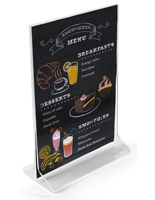 This table sign holder is a cheap alternative to the somewhat pricier wood or metal frames commonly used in upscale locations. 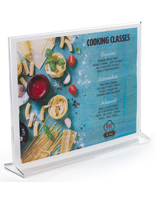 This print frame is also suitable for use in a retail store to post important facts regarding products or services. 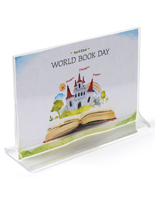 Buy this table sign holder before 3PM to qualify for same day shipping options. These worked out well for our client. We bought 60 of these and are very satisfied, They arrived quickly and are exactly what we expected. Not real heavy, just right, Will buy these again. Recommend.